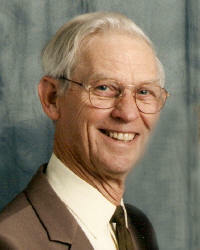 Leland E. “Lee” Johnson, 78, of Breese, died Wednesday, July 11, 2007 at St. Joseph Hospital in Breese. Mr. Johnson was born July 29, 1928 in Carlyle to Dosker and Hattie (Brown) Johnson; they preceded him in death. Also preceded in death by a grandson, Joshua Detmer and brothers, Kenneth Johnson and Paul Johnson. He married Dorothy Maue on April 16, 1951 at St. Augustine’s in Breese; she survives in Breese. Also surviving is a daughter, Yulonda (Fred) Detmer and a son Robin (Donna) Johnson all of Breese. 7 Grandchildren, Rhonda (Josh) Siegfried, Aaron Detmer, Jacob, Seth, Kristi, Cole, and Elaina Johnson. 2 Great-Grandchildren, Noah and Chloe Siegfried. Lee retired as a union carpenter from Local 433-Belleville, and he enjoyed woodworking and camping. He was a member of St. Augustine Catholic Church, Breese American Legion Post 252, Carpenters Local 433-Belleville, and was a veteran on the United States Marine Corps. Funeral Mass of Christian Burial will be Saturday, July 14, 2007 at 10:00 a.m. at St. Augustine Catholic Church in Breese with Fr. Daniel Friedman officiating. Interment will follow in St. Dominic/St. Augustine Cemetery, Breese. Visitation will be Friday, July 13, 2007 from 4:00-9:00 p.m. and again on Saturday, July 14, 2007 from 8:00-9:45 a.m. at the Moss Funeral Home in Breese. Breese American Legion will hold services at 7:00 p.m. Friday evening at the funeral home. Memorials can be made to his grandchildren’s college fund and will be received at the funeral home.